An early start at Poker Stars HQ for publicity photos. They are to be our headline sponsor for the Isle of Man Food and Drink Festival in September this year. Back to Tynwald for an Environmental and Infrastructure Sub Committee meeting, building on the Programme for Government in terms of reviewing our planning system. Lunchtime presentation of the MONEYVAL Assessment of our financial sector. Afternoon back to DEFA at St Johns for department business and latterly discussion over planning appeals. This entry was posted in Uncategorised on 31st January 2017 by geoffreyboot.org. This entry was posted in Uncategorised on 27th January 2017 by geoffreyboot.org. This entry was posted in Uncategorised on 26th January 2017 by geoffreyboot.org. Early morning meeting with constituents – apparently I’m doing a good job! Then to Tynwald for a meeting in the office of Minister of Policy Reform with Jo Ruxton of Plastic Oceans Foundation. An extremely informative meeting, she is spearheading a campaign to reduce or eliminate plastic being disposed of deliberately or inadvertently into our seas/oceans. Well worth having a quick look at this link https://youtube/6zrn4-FfbXw. There is a possibility they will position a regional hub on the Isle of Man which will certainly add to our biosphere credentials. Followed by a business lunch then back to my office for some much needed administration catch-up. House of Keys sitting. A busy order paper for me, an oral question regarding what action the department intends to take to ensure the long term viability of the Meat Plant. We are of course prioritising securing the future the Meat Plant and questions resulted in a number of probing supplementaries where I was able to offer reassurance that we view the Plant as a farming strategic asset. There followed a debate on whether or not standing orders should be amended to allow the Keys to turn itself into a committee when looking at legislation. I was opposed to this as standing orders and the way we debate are there for a reason and a committee of 24 will prove challenging, but my fellow members despite my speech left me a minority of one so we will see how this pans out in due course. I then presented the Dogs (Amendment) Bill 2016 for it’s second reading which went through with some debate about DNA testing, which is not part of this Bill, it’s more about animal welfare and micro-chipping but I have undertaken to look at feasibility of DNA testing within the department but this will require proper consultation. The final piece of business Dr Allinson’s move to introduce a private members bill to update our abortion laws. I had received and continue to receive much correspondence from both sides of the equation. My preferred option was a committee referral before drafting but this was defeated and consequently we were asked to vote on the main motion which after considerable debate and reassurance from Dr Allinson that he is anticipating committee involvement at a later stage after drafting, the vote for him to bring forward a private members bill was passed with a substantial majority. I have to say his speeches were both passionate and informed. It will be interesting to see the draft bill in due course. Meeting with the DEFA departments Press Officer a media briefing on forthcoming launches and a visit to the island by Countryfile. Meeting with Friends of the Earth, a cordial liaison meeting where we were able to brief them on present initiatives with regard to problematical waste, carbon emissions and air quality. I hope that working with the programme for government we are seen to be taking action where we can. Unfortunately progress is not always as fast as campaigning groups would like. Afternoon department briefings for Keys on Tuesday. Spent most of the day preparing for and having a meeting with the Northern Ireland’s Minister of Agriculture, Environment and Rural Affairs Michelle McIlveen MLA. It was a useful meeting as per press release below. Sadly the NI Assembly has dissolved and there will be a general election in March which will result in a Cabinet reshuffle and in all probability a new Minister. However, we have made some good contacts and progress with the Officers. The Island’s Minister for Environment, Food and Agriculture met his Northern Ireland counterpart for the first time today to discuss matters of mutual interest relating to fisheries. 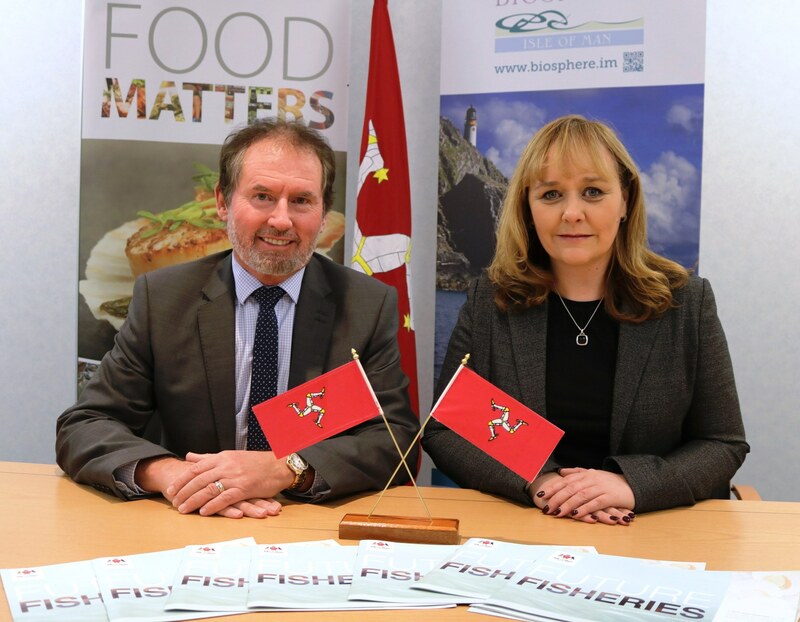 Discussions between Geoffrey Boot MHK and Michelle McIlveen MLA, Northern Ireland’s Minister of Agriculture, Environment and Rural Affairs, centred around Irish Sea fisheries management and the scientific developments that are enhancing understanding of stocks. Areas in which the jurisdictions could potentially collaborate were also on the agenda. Minister Boot discussed with Minister McIlveen his Department’s Future Fisheries strategy 2016-2021, which sets out a vision for sustainable and diversified fisheries supported by a high quality marine environment. Minister Boot said: ‘Fisheries is a traditional and economically important industry for both the Isle of Man and Northern Ireland and we have a common interest in managing and better understanding fish stocks to ensure sustainability. Minister McIlveen said: It is important to develop strong relationships with our neighbours and to work towards introducing sustainable fisheries policies that are of benefit to all. During her brief visit to the Island, Minister McIlveen was also shown around Tynwald by Minister Boot. This entry was posted in Uncategorised on 19th January 2017 by geoffreyboot.org.